Kevin Hjertaas knows snow. Up until 2015, he worked as an avalanche forecaster at Sunshine Village Ski Resort, near Banff, Canada. His job was to predict where and when thousands of tons of snow might come cascading down the mountain, potentially burying and killing skiers and snowboarders. But to do so, he had to understand the snow. And to understand the snow, he had to go out and dig holes in it. “You dig a hole to see all the layers in the snow,” Hjertaas says. With a small metal shovel, he would dig a pit about six feet wide and six feet deep. The pit, called a “snow profile,” allowed him to better understand how snowfalls literally stack up throughout the winter. It’s a critical piece of information in predicting the risk of avalanches. The root cause of most avalanches is a buried weak layer in a mass of snow that has accumulated across several storms. So, to make a forecast, avalanche professionals like Hjertaas need to understand the snow’s layering and structure, or “snowpack.” From inside a snow pit, Hjertaas can poke and prod every layer deposited since the start of the winter, looking for textures that signal avalanche danger, such as loose, sugary granules or feather-like crystals. It may seem rudimentary, but digging holes is a key part of the work of avalanche forecasters. At ski resorts, in parks and alongside highways, snow profiles form the basis for understanding the snow’s mechanics and judging how current weather and terrain factors might affect it. And so far, in most of North America, there aren’t any alternatives. But methods may be changing. 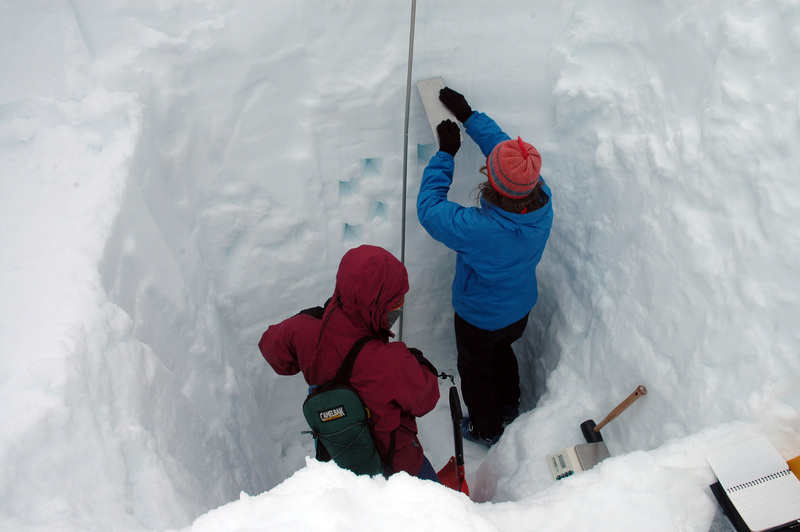 Researchers are building a computer model to simulate the snowpack. And every winter, they are getting closer to making it functional. The question is whether it will ever be good enough to replace people like Hjertaas, going out into the snow to dig. At ski hills or within parks, forecasters can easily collect enough field data to characterize the local snow and its associated risks. Once they understand the snowpack, they’ll make a forecast by analyzing weather and terrain factors that might affect avalanche risk, such as precipitation, temperature and the steepness of a slope. At resorts, snow safety teams use the information to pinpoint high risk slopes, where they can set off avalanches when visitors aren’t on them. But backcountry skiers, snowboarders and snowmobile operators who venture outside of resorts’ boundaries want avalanche forecasts too. The problem is that there simply aren’t enough forecasters to cover all the areas into which they might venture. Avalanches killed 46 people in North America in 2016, according to Colorado Avalanche Information Center and Avalanche Canada, a non-government organization that publishes regional forecasts online for backcountry users. Forty-five of them were in backcountry areas. Backcountry recreation has been booming in the past decade. Glacier National Park saw 50 percent more skiers in 2015 than in 2010, and backcountry ski boot sales increased 27 percent in 2016, according to Kootenay Mountain Culture magazine. “People are out all over the place,” says Mary Clayton, the communications director at Avalanche Canada. Their forecasting program is the biggest in the world, but in the northern reaches of the country, there are no avalanche professionals to collect snowpack information. And without it, they can’t make a forecast. It’s a problem that has likely already contributed to fatalities, Clayton says. In fact, one of the forecast-free regions in north-eastern British Columbia accounts for 10 percent of deaths in the province, according to a 2014 report. “That’s where we see models could play a role,” says Simon Horton, who studies avalanche mechanics and is involved with the research at Simon Fraser University in British Columbia to build a snowpack model. Weather forecasts and models of the snowpack structure could fill in holes in the data, he says. In the next few years, forecasters may be able to put down their shovels. Alongside a team of snow scientists, Horton has been working on fine-tuning a model that could predict the snowpack based on weather data alone. The model has been in the works for more than 10 years in Canada, but it’s not an original idea. The first versions were developed in Europe in the 1990s. Other countries have adopted the technology since then. “Norway uses them now, and some avalanche forecasters in Colorado,” says Horton. In Canada and many parts of the U.S., however, the models are not yet fully functional. Part of the reason is that the original versions depend on weather stations. In North America, weather stations are sparse. “The actual physics in the model should apply equally well anywhere you go in the world, but just having the weather data it needs to run is the challenge in North America,” he says. In 2011, researchers from the University of Calgary adapted a Swiss model to run off Canadian weather forecast models. It could predict weak layers in the snowpack with 91 percent accuracy, according to their study, published in Cold Regions Science and Technology. However, it tended to overestimate weak layers caused by some types of snow crystals known to cause avalanche problems once they get buried, like loose, feathery crystals formed at the snow’s surface or crusty, slick layers created when the snow melts and then re-freezes. The model also had trouble accurately simulating the snow’s depth early and late in the season. Since then, researchers have been fine-tuning the model and adjusting it to incorporate technological improvements. In 2013, researchers made a higher resolution version and in 2015, Horton developed a system that could map problematic snow crystals. Most recently, a team from Laval University in Quebec announced the results of a field test, in which they found that the highest resolution models were 30 percent better at simulating the snowpack’s thickness than the lower resolution versions. Their research was published earlier this year in Physical Geography. The model is still far from perfect, but it’s getting closer. One of the biggest problems in refining it is that it depends on accurate weather forecasts, says James Floyer, Avalanche Canada’s forecasting program supervisor. “If the weather doesn’t hold true early on in the season,” he says, “those errors will increment themselves throughout the season.” It also doesn’t take fine-scale differences into account, such as wind, slope or the presence of trees, which might affect the snow’s texture and structure. And in far-off, data-sparse regions in northern Canada, like in the mountains near Whitehorse or Fort St. John, it’s impossible to adjust for the errors the model might make. There aren’t avalanche professionals there to check that the modelled snowpack matches actual conditions. A fully operational model could be ready within one or two years, says Floyer. Even if the model worked perfectly, forecasters may not be keen to take up the technology. So far, reactions have been mixed. “A lot of people in this field get into it because they love the mountains and they love being outside,” Horton says. Using a model might mean that forecasters have to spend more time behind a computer.